Makeup isn’t something we talk about around here, well, EVER, but I always like to get a peek into what products other people use. I thought some of you you might feel the same way! I like to wear a little bit of makeup everyday, even if I don’t leave the house, because I think it’s fun and it makes me feel more put-together. In typical boy fashion, Andy hates makeup and says I don’t need it, which is nice, but I’m going to wear it anyway for myself. Last year I started experimenting with cream formulas instead of powders, and I love them so much more, especially in the summer. I felt like powders were sitting on top of my skin, looking and feeling really obviously like makeup and drying out my skin, while cream formulas feel nice and look more natural on me. The only powder I wear is a little bit on my nose and forehead to cut down shine. And that’s about it. I have more products for special occasions or just to switch it up every once in a while, but this is all that I keep in my everyday makeup bag for summer. I find that keeping my makeup bag minimal saves me so much time and energy getting ready, and ultimately I end up buying fewer products that I don’t really need. What about you? Do you wear makeup everyday? 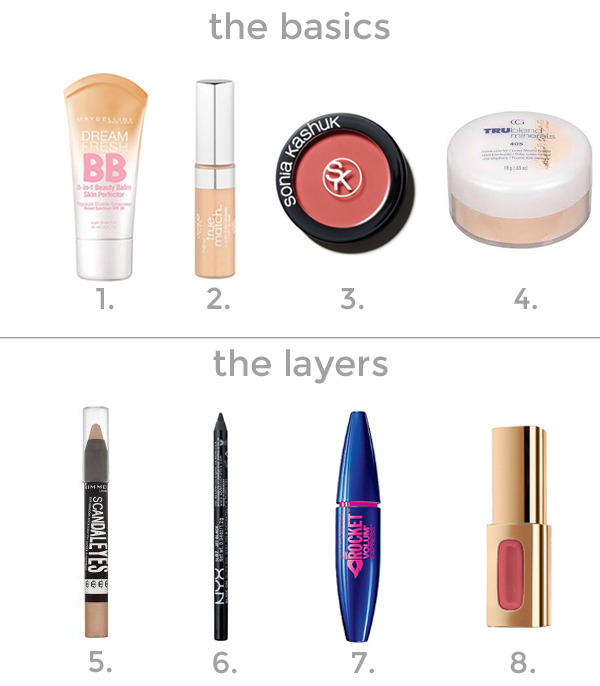 Do you have some drugstore products you love and recommend? Do you use any of these same products? Happy Fourth of July weekend, friends! We hope you have a great, happy, safe one!